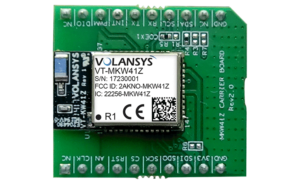 The VOL KW41Z module is an ultra-compact, low power, high sensitivity module that supports Zigbee®, Thread with IEEE 802.15.4 and Bluetooth Low Energy (BLE 4.2) RF connectivity. Built with a 32-bit ARM® Cortex® M0+ CPU operating up to 48 MHz, and an integrated chip antenna, VOL KW41Z provides OEMs with a dual RF solution for dynamic application needs, with minimal development, reduced risk, and faster time-to-market. VOL KW41Z is enriched with mikroBUS™ compatibility to connect to third-party products with a single click. It is an ideal solution for true single-chip designs that require concurrent communication on Zigbee®, Bluetooth Low Energy 4.2 and 802.15.4 based networks such as Thread, at reduced BOM cost. This multi-mode functionality as Thread module and Bluetooth module allows direct integration into thread mesh networks and direct communication with mobile devices via BLE. 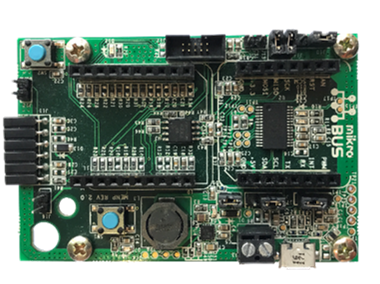 The Modular Edge Node Platform development board (MENP) is an advanced multi-module compatible end node that supports various hardware modules through mikroBUS™ connectors. 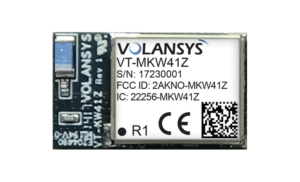 VOL KW41Z module is mounted on this board to utilize the complete range of features and functions of the module. The development board has two mikroBUS™ compatible sockets which provide SPI, I2C, UART and GPIO interfaces. 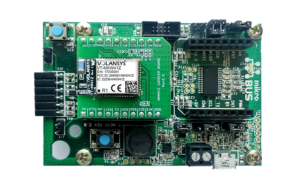 This ready-to-use development board can be used to build Thread/BLE based end device prototypes with faster time to market. For further information on this development board, read more.